&quot;these are a few of m favourite things&quot; Day 10 - My Favourite Mani! "these are a few of m favourite things" Day 10 - My Favourite Mani! Can't believe this is the final day of Ooh La La Polish's "these are a few of my favourite things" Nail Art Challenge. I've really enjoyed doing it and am happy to say that I have learnt at least 1 new technique. Anyone that knows me or that has been following my blog for a while will know that my all time favourite mani is Leopard Print! Add to that the fact I rarely have my nails painted 1 colour I decided to go with Pastel Skittle Leopard Print! I used the Nails Inc "The Icons" for each nail and NYC Pinstripe White for the spots. I hope you enjoyed seeing my attempt at the challenges each day and I look forward to the next one. Super cute! 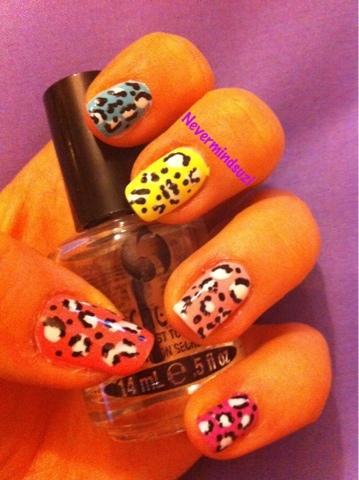 I love leopard mani's! 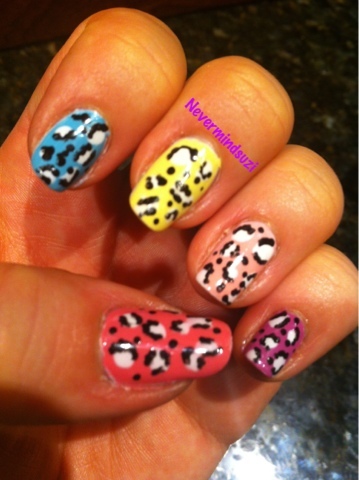 I love your leopard print manis, it's even better with skittles! I like bright coloured prints too this is lovely!